Using ipython notebook with Apache Spark couldn’t be easier. 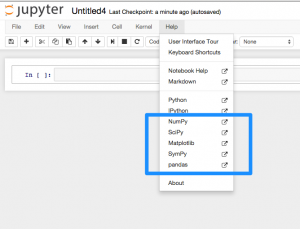 This post will cover how to use ipython notebook (jupyter) with Spark and why it is best choice when using python with Spark. I recommend the use the Python 2.7 Anaconda Python distribution which can be downloaded here https://www.continuum.io/downloads. It contains more than 300 of the most popular python packages for science, math, engineering, and data analysis. Also, future python spark tutorials and python spark examples will use this distribution. A browser tab should launch and various output to your terminal window depending on your logging level. Hopefully, this snippet makes sense. If IPYTHON_OPTS is present, use ipython. Why use ipython notebook with Spark? 1) Same reasons you use ipython notebook without Spark such as convenience, easy to share and execute notebooks, etc. 2) Code completion. As the screencast shows, a python spark developer can hit the tab key for available functions or also known as code completion options. Hope this helps, let me know if you have any questions. To continue with Python in Spark, check out the Spark Transformations in Python and Spark Actions in Python tutorials. Next tutorial with ipython is ipython with a Spark Cluster.